Kinect for $20? Oh China. 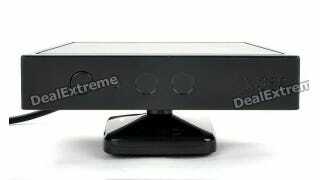 What's this, a new, more angular version of Microsoft's Kinect? Not quite. It's just a wireless receiver for a PC that looks like a Kinect, down to the Microsoft-inspired packaging. But wait! Don't write it off as some useless piece of Chinese junk. This may be worth a novelty shot, as it'll let you use a wireless 360 pad on a PC. Provided it works. And I'm not going to make that guarantee.